Disarm Doors and Crosscheck: GREAT BARRIER REEF? It's even better than that. GREAT BARRIER REEF? It's even better than that. When you're peering across acres of coral in the shallows 70 km out to sea off the coast of Port Douglas, you realise that it's not called the Great Barrier Reef for nothing. A short distance away, the energy carried by the South Pacific collides with Australia's continental shelf. This is irresistible force meets immovable object stuff. And yet, somehow, we're bobbing about peacefully unawares of the battle playing out across the coral barrier nearby. Snorkelling here can be mesmerising. Eyes up, gazing forward through a thin film of water separating life below from life above. Making yourself as skinny as possible to avoid scratches and cuts from the coral. Drifting over those sharp, corally fingertips reaching for the surface, making the gentlest movements with your flippers to keep yourself in slightly deeper water before the coral and ocean floor suddenly falls away leaving you soaring across an ever darkening depth. Your gasp exaggerated by the snorkel pressed beside your ear. As a kid I found the edge of the reef absolutely terrifying. One moment I'm happily flapping around in the comforting shallows chasing preposterously coloured fish, and the next the blue-blackness of The Dreaded Ditch swallows me. For sure it's full of big things with teeth just waiting for my bite-sized bits to drift into view. Panic. Bubbles. Flippers going crazy seeking the safety of the sandy shallows again. It's funny. Out on the Agincourt Reef now as a grown-up, drifting towards the reef's dark edge, I feel…something. Perhaps a few synapses bursting with remnant fear. 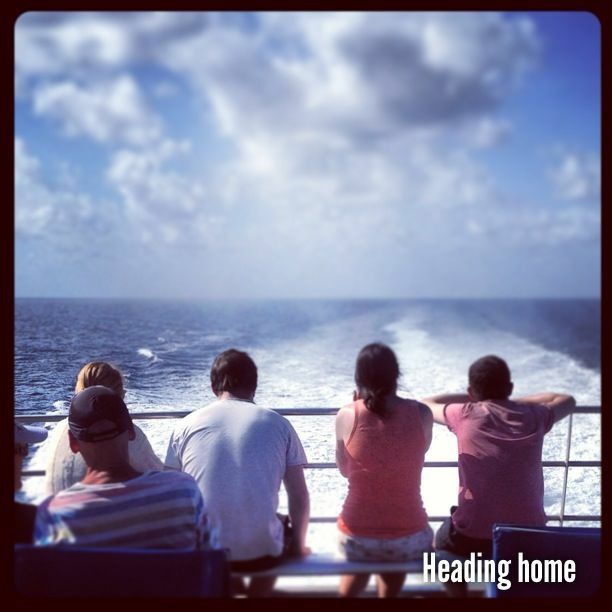 The rest of them saying Nah, it's all good, mate…enjoy the feeling. There's something about entering what is, let's face it, another world. Life is different down there. There are critters you can't imagine existed without diving in and seeing them for yourself. And apart from those near-death encounters with The Ditch as a kid, I've always enjoyed it. So when an opportunity to spend a day out on The Reef came my way, it was a no-brainer, even if I had reservations about the industrial scale of a visit on Quicksilver. All those people crammed into a huge boat, fighting for the best seats, the best equipment, the best vantage points on the reef pontoon, not to mention elbowing each other out of the way for the first crack at the buffet lunch. That, I wasn't looking forward to. Turns out my fears were unfounded. 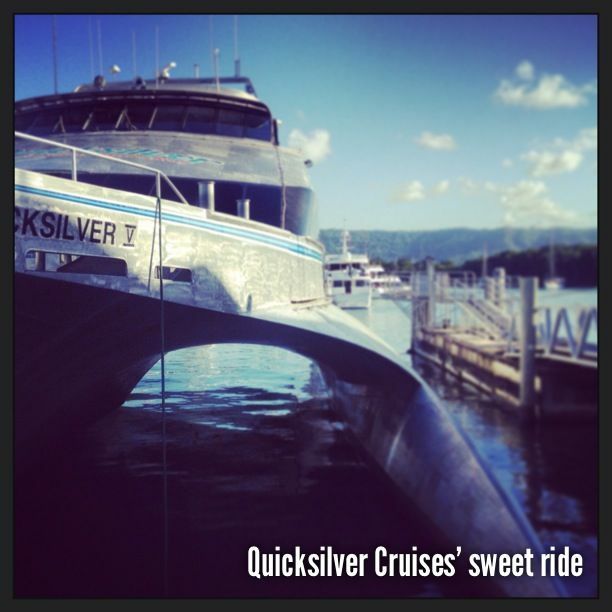 A day with Quicksilver is an effortless experience. 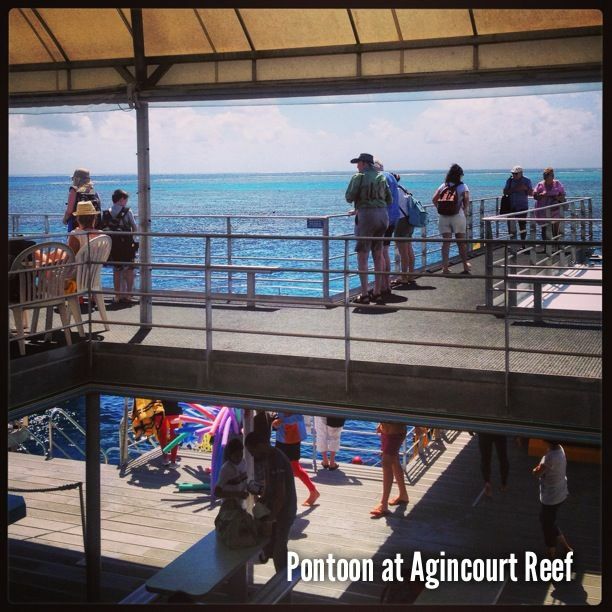 Turn up, take a comfortable seat, enjoy the 90 minute ride out to the reef, and step aboard the enormous, 2-story pontoon. Wonder for a minute how on earth it got there. Saunter over to a table in the sun or shade and pop your stuff down. Hungry? Grab a plate and explore the buffet. Really hungry? Go again. Collect your snorkelling gear then step down to the water's edge. 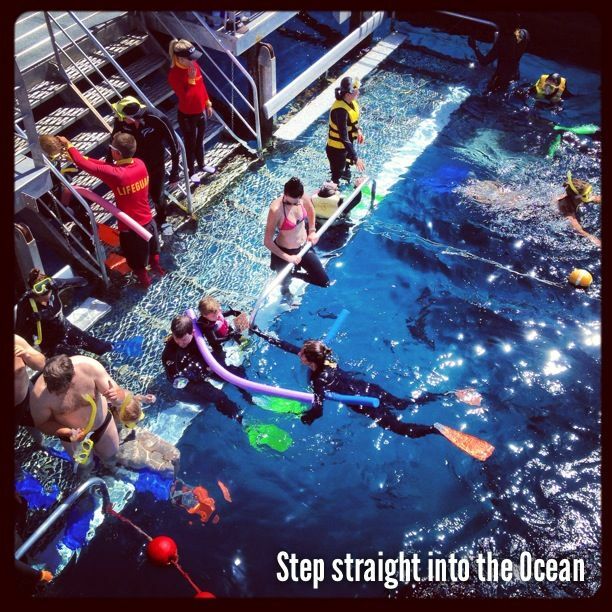 Fit your mask, snorkel and flippers. Push off and away you go. Don't like getting wet? 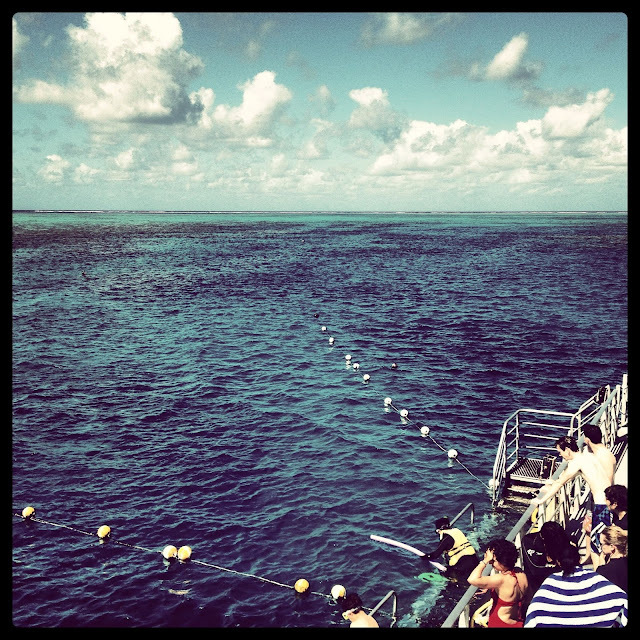 Spend some time in the underwater observatory or on the semi-submersible as it criss-crosses rich corners of the reef. Rather see it from above? Hire the chopper. 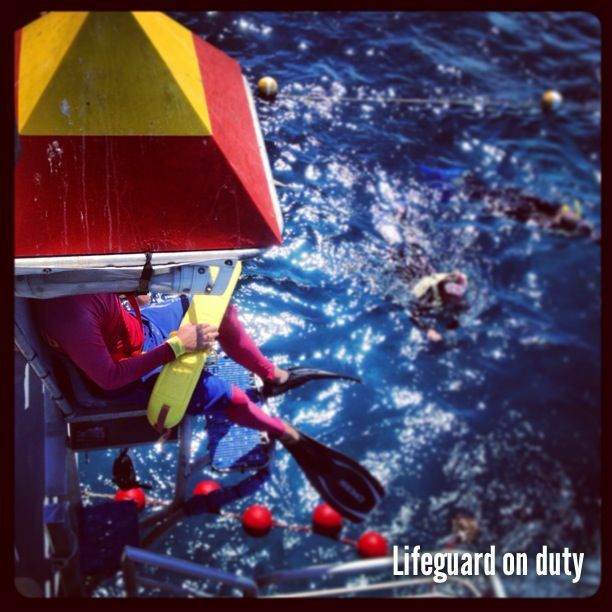 Ever wanted to stand on an underwater platform in a dive helmet? Can do. Expectations of unpleasant over-crowding? Blown out of the water. And I can't wait to get back in. Looks like a wonderful days adventure. Not sure about the snorkeling but would certainly enjoy a ride and the view from the semi-sub. My next holiday. It really is a great day out, Lyn. Just being out there is stunning...above and below the water. I hope you get out there one day. Oh my goodness! 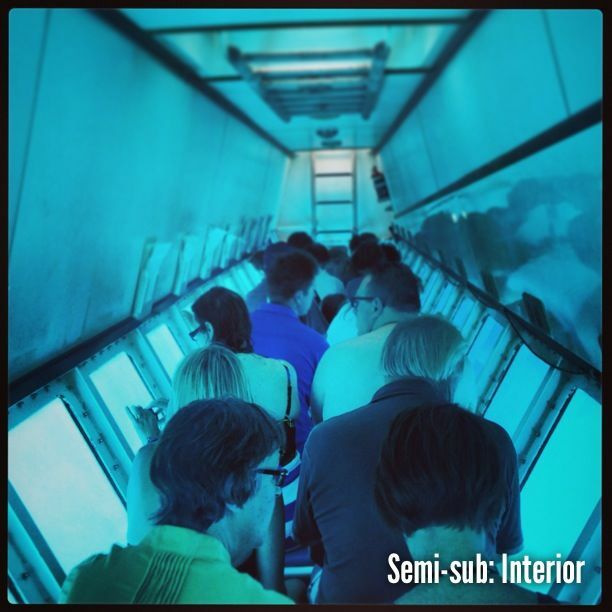 the semi-sub sounds awesome! 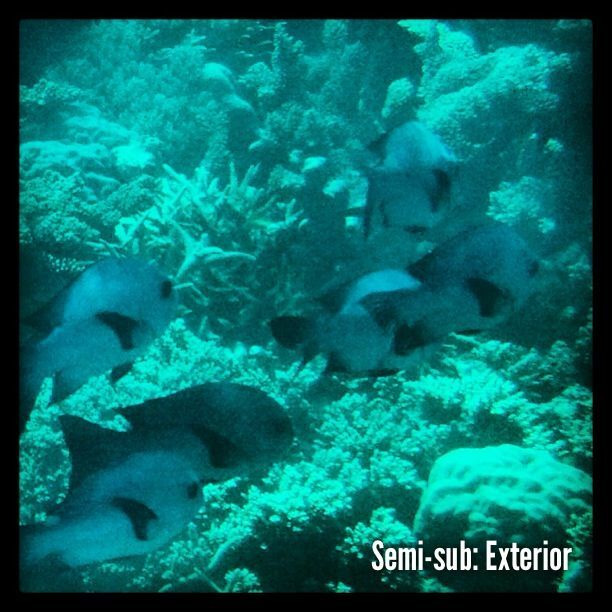 Personally, I prefer snorkeling but I think I'd enjoy the semi-sub experience. 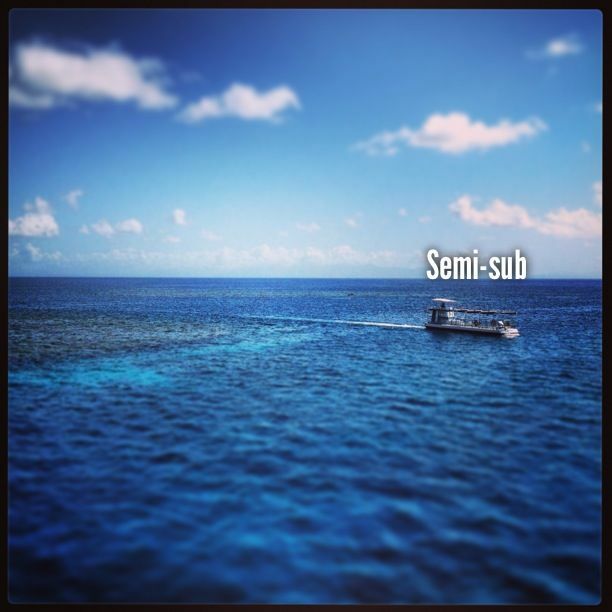 I'm really excited about the semi-sub. I like this post Mr Ben - I like it a lot. I'll definitely try this on my next vacation in Australia. By the way, nice photos! Thanks so much. Definitely worth doing...really fun.